Though no timetable has been formally set on the rebuilding of Funtown Pier, Seaside Park officials are ready to take one step in preparing for the project. The borough council on Thursday night discussed plans to give up an easement along the boardwalk in contemplation of a repositioning once the rebuilding effort begins. The borough has always maintained an easement on Funtown Pier property which allowed the boardwalk to be fully accessible to the public at all times. Under the easement agreement, Funtown Pier remains the owner of the slice of boardwalk and is responsible for maintaining it and handling its liability, but the borough ensures that it is held in the public trust. That agreement must be dissolved before construction begins, however officials say Funtown Pier’s ownership has agreed to maintain the same arrangement in the future. The necessity for ending the agreement is due to the fact that a rebuilt pier entrance could move the boardwalk access area slightly. The new deed of easement will call for an “unobstructed” walkway on the boardwalk from one side of the pier property to the other, said Borough Attorney Steven A. Zabarsky. “The dimensions of the easement can’t be defined because they don’t know where their buildings are going to go yet,” Zabarsky explained. “What you’re supposed to be able to do when all this is finished is, when you’re on the boardwalk, be able to look straight down,” said Councilwoman Nancy Koury. Council President Michael Tierney said the easement will allow for a 16 foot-wide path through the property. 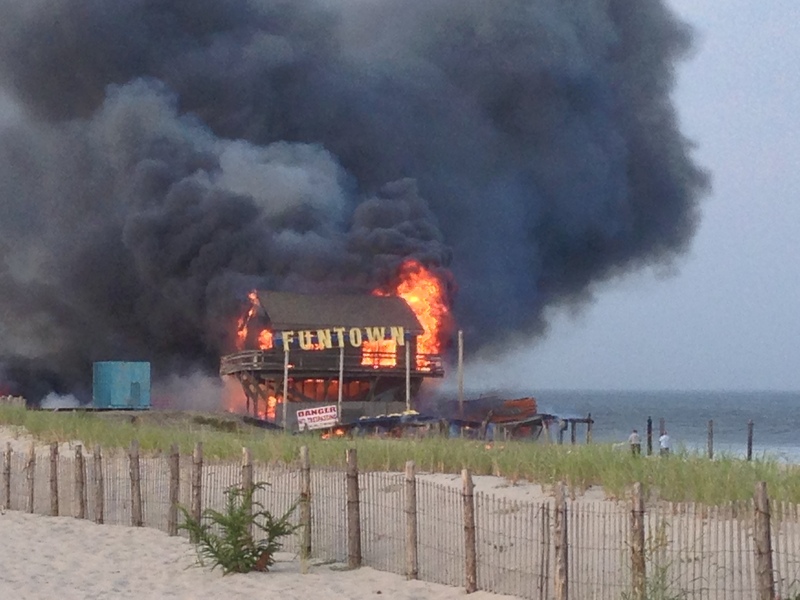 Funtown Pier was destroyed when it fell into the ocean during the Sept. 2013 boardwalk fire. The pier’s owner has proposed rebuilding the structure with thrill rides which require a height variance from the borough. Plans for yet to be formally proposed, with the owners reportedly waiting on the completion of a federal beach and dune replenishment project before starting work.